Bixbee, designers of fun and functional backpacks with a conscience, announced today its popular kids backpacks will be available to Target shoppers at 150 locations across the country starting March 4 through the end of April, including Arkansas, Alabama, Arizona, California, Colorado, Florida, Georgia, Iowa, Illinois, Indiana, Kansas, Massachusetts, Maryland, Michigan, Minnesota, Montana, North Carolina, Nebraska, Nevada, New York, Oklahoma, Pennsylvania, Tennessee, Texas, Utah and Wisconsin. Bixbee believes that every child deserves access to the tools necessary to learn and succeed. For each backpack sold, Bixbee donates a schoolbag with supplies to a child in need. It’s all part of the company’s “One Here. One There.” social mission which has donated backpacks to children in Thailand, Honduras, Rwanda, USA, India, Philippines, Belize and Haiti. 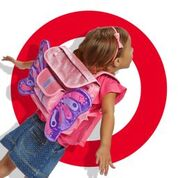 Target shoppers can select from a wide variety of Bixbee backpack styles all priced at $29.99 including its Sparkalicious Pink or Purple Butterflyer, six different Animal Packs, the Fire Bird Flyer, Rocketflyer and the Unicorn. With a patented, award-winning horizontal design that offers superior quality and ergonomic attributes, Bixbee's playful styles inspire children to embrace their imagination - all while teaching them the importance of giving back. Ergonomic excellence: All Bixbee backpacks have a patented horizontal design with ergonomic features to help keep the backpack’s weight at waist level and plenty of pockets to help distribute weight evenly across the child's shoulders. Easy to carry and custom fit: Adjustable, contoured and padded shoulder straps designed to achieve optimal fit and alleviate pressure points. Tailor-designed in three sizes to fit children’s unique measurements. Loads of storage: The backpacks are perfect for a 3 to 6-year-old and comes with three to four exterior pockets and two interior slip pockets for school supplies. A customizable ID card holder under the main flap makes sure backpacks find their way home. Quality materials with safety in mind: Bixbee backpacks are made to be lightweight yet durable with water-resistant materials. And, each backpack comes with reflective accents that provide visibility and safety in low light. All materials used are certified PVC, BPA, phthalate and lead–free so they’re safe for kids. In addition to being in store at Target stores, Bixbee backpacks, duffles and lunchboxes are available for purchase now directly on http://www.bixbee.com. Bixbee’s vision for helping kids reach their potential through education first took shape when co-founder and CEO Luis Garcia spent 4 months traveling and volunteering at schools and orphanages around the world. He realized that these kids were like millions of others – eager for an education, but lacking basic school supplies. Moved by his experience, Luis, a seasoned luxury product designer, set out to create Bixbee, a company modeled after the "Buy One, Give One (BOGO)” movement that provides unique products loved by kids and approved by their value conscious moms.